Please refer to our stock # 7236 when inquiring. 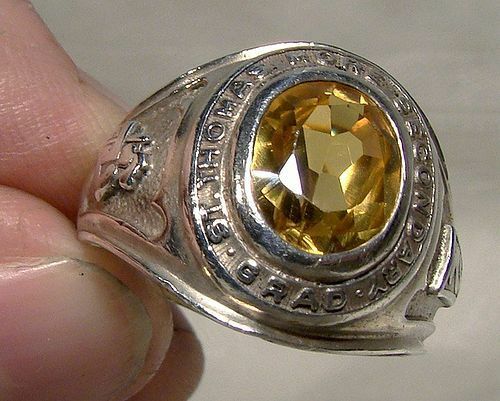 A Birks sterling silver yellow sapphire school graduation ring dated 1976 from St. Thomas More Secondary School in Hamilton, Ontario, Canada. This size 8-3/4 ring features a natural yellow sapphire, it measures 11/16" wide across the setting and it has a 76 date on one shoulder and GM initials on the other. It is stamped with partial marks for BIRKS and STERLING which have been obscured due to a resizing in the past. It weighs 6.8 grams and it is in excellent condition with no chips, cracks, dents, bends, corrosion, losses, damage or repairs. All items are thoroughly and conservatively graded and all condition issues are noted; all items are vintage or antique and may have slight signs of gentle use. Tracked Packet shipping to the U.S. starts at $14.50 - this includes online tracking, air service and insurance up to $70. Items paid with a credit card will be shipped to confirmed addresses only. We do ship internationally. All of our prices are in $US. PLEASE NOTE: We DO NOT accept PayPal.